located at 2nd and F Street next to the Varsity Theater (see left side of photo). In 1951-52, the house was moved to this location. 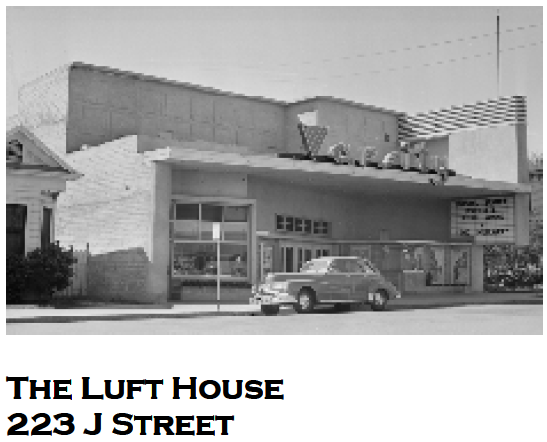 John C. Luft was a blacksmith and movie theater owner. John C. Luft was one of the earliest businessman of Davisville. He was a blacksmith, commercial developer, and opened the first movie theater in town, the Varsity Theater. The original theater was located on 2nd and F Street, next to the current Varsity Theater. Phyllis used to go to Uncle John’s Varsity Theater to see the silent films. Her cousin Maude Luft would play the organ. Then later when the “talkies” started, she remembers the neighborhood kids sitting in all parts of the theater and telling the projector man, Mike Luft, how the sound system was working. This one story Queen Anne cottage has a pyramidally hipped primary roof with a gable section projecting toward the street. The gable end has a louvered vent and is sheathed with fishscale shingles. The gable tops a slanted bay and there is a small amount of machined ornament. The porch has a shallow hipped roof supported on turned columns. There is no railing on the porch. There are several one over one double hung windows. What has happened since the Lufts’s lived here? In 1942, when John C. Luft died, their daughter, Maude Louise MiIIar, moved from Los Angeles with her daughter Mary Louise and lived with Etta Luft in this house at its original location at 2nd and F Street. In 1952, the house was moved to this location. At that time, Etta Luft, her daughter, and granddaughter, moved to 336 A Street. Mary Louise remembers it as “moving to the countryside”! After it was moved, John C. Luft’s son, Oliver, bought the house and converted it into two units. Note the two entrances on the porch. Oliver rented out the two units and lived in the Porter house which was located to the right of this house, currently an empty lot. The house was sold by the Lufts and returned to a single family residency. Barbara Boehler and her family currently owns and lives in the home.